Gianni Downs’ minimalistic scenery welcomes the audience to an atmospheric ghost story. As the audience enters the theatre, they see a raked black stage with a single deep purple velvet chair and slight blue lighting on the stage. However, the main focal point runs from the stage to the balcony—a collection of ropes tied off in waves across the ceiling that lead to ropes hanging down next to the chair. I’m intrigued. Upon reading the director’s notes in the program, I am enthusiastic to see her desire to honor Henry James’ preference to leave fear to the imagination. Unfortunately, from the time the house lights go down to the curtain call, I see too much. The heavy-handed interpretation of the director combined with exaggerated characterizations lead to a production that is only scary in that it does not trust its material or its audience. The main responsibility for gaining the audience’s trust is in the hands of the male actor: Ryan Landry. This tall disheveled man in Victorian costume takes on all of the main roles (narrator, the uncle, Miles, and Mrs. Grose). Mr. Landry grabs every laugh—even when laughter is inappropriate. The fact that his portrayal of the uncle has no chemistry with the governess leaves her without a large portion of her motivation to tend to the children. His housekeeper, Mrs. Grose, is a cross between Dame Edna and Stewie Griffin; when crisis arises and we need to see fear through Mrs. Grose’s eyes, she has no credibility and elicits no sympathy from the audience. The only character that Landry truly embodies is the young boy Miles. While he spends more time as this character than others, the lack of definition of the other characters leaves the audience questioning what or who he is (the audience actually made comments about this as they were leaving the play). These androgynous caricatures subjugate the suspense and fear that story creates. As he pushes the governess away, Landry’s portrayals push the audience away from sharing any intimacy with the play. Molly Schreiber does her best to withstand this towering force and reach some moments of sincerity and depth. Unfortunately, to prevent herself from being overtaken by Landry, she attempts to match his ridiculous energy and fails to reveal the heart of the character. This leaves the audience alienated from the last possible character to reach out to and to seek the guidance of the director to get them through the eighty minutes with no intermission. Caitlin Lawson’s direction betrays her desire to allow the audience to use its own experiences to build their fear. Constantly through the character exchanges, either from her direction or lack of control, they provide only one interpretation that is somewhat twisted, but not scary. The question of whether this idea is being thrust upon the audience by accident or deliberate intent is confirmed when the governess confronts Miles for the first time. Innocence is lost. You must believe what you see over what they say. Mystery is lost. 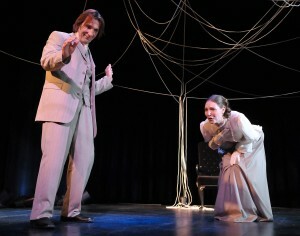 Jeffrey Hatcher’s play provides an interesting rendition of Henry James’ novella and with my imagination I can envision a play that could be full of mystery and horror. Regretfully, Ms. Lawson’s production leaves me at that point. All interpretation and energy is consumed by the production and the audience is left wanting. The only mystery for the audience is: what exactly is Ryan Landry doing? 10/24/10. TNETG. This entry was posted in Drama and tagged 2010, Drama, Horror, Imagination, MA, Molly Schreiber, Professional, Ryan Landry, Stoneham, Stoneham Theatre, Turn of the Screw by beccackidwell. Bookmark the permalink.